Infrastructures of potentially dozens of servers have built up around corporate email systems to provide better governance, reduced risk and improved legislative compliance - anti-virus, anti-spam, attachment handling, encryption, disclaimers, archiving and hot-standby mail servers to name a few. 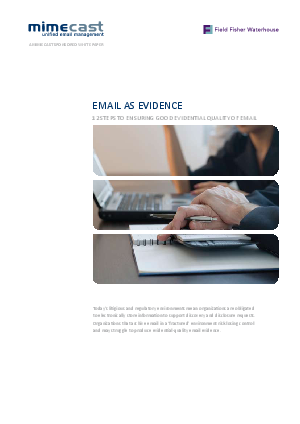 These disparate email environments provide a fragmented approach to applying email policy and lack overall visibility of email threats. This traditional approach also impacts the quality of the evidence that can be provided by creating barriers to extracting information quickly and in a relevant format.